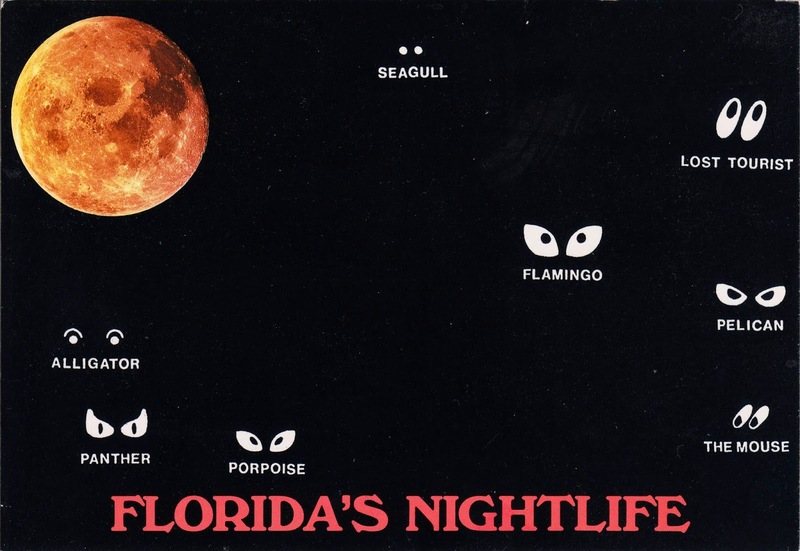 Postcard US-1651277 to Russia shows various nightlife in Florida under a "blood moon". In the early morning of April 15, 2014 when a total lunar eclipse occurred, the "blood moon" was visible from most of North and South America, Hawaii and parts of Alaska. A total lunar eclipse occurs when the moon, the earth, and the sun are in alignment. As a result, the moon is completely covered by the Earth’s shadow. The following photo shows the total eclipse of the moon underway over Las Vegas, Nevada as seen from West Sahara Avenue and South Valley View Boulevard around 12:40 am on April 15, 2014. The bright star on the lower-right corner is Spica from the constellation Virgo, the 15th brightest star in the sky. The eclipse was the first of four consecutive total lunar eclipses, known as a tetrad, on April, 15, 2014, October 8, 2014, April 4, 2015, and September 28 2015.